I voted webbed, because those are what everyone thinks of when they think of "dragons." But I'm open to feathered wings (the wings of the whites have long had a place in my heart and the wings of the canopies are lovely, too). I wouldn't mind some more of those. Keep in mind, though, there's more than just "feathered" and "webbed" to choose from. Silvers and Sweetlings have no wings at all (the Sweetlings have little feathered...things, but those are not wings) and the Water and Deep Sea dragons are "wyrms" in which they have no wings or legs either, though they do have fins and flippers. Edit: I have long wished TJ would allow us to vote on a release. He let the mods do it; I think it would be nice if he'd let us do it. Oh, not all [random number here] completed dragons, but maybe choose 25 types and then have us vote the five to release, or something. There are so many lovely sprites languishing in DC's version of Development Hell. I love both, but this site is SERIOUSLY in need of more feather-wings. I mean, there are only TWO feathered breeds and one of those is only available at Christmas! I think webbed looks more dragony, feathers look like large birds sometimes hehehehe - to spiriters, that's just a general opinion. I seriously thought the canopies had feathered wings. I guess it was the rainbow colors and the female's position. But I guess I can see the ridges of webbed wings on the male now. Although, do the little feathered...thingies...on the Sweetlings' shoulders count? They are feathers, of that I'm certain. But, they're still Holiday-only dragons, like the Snowangels. I think the Sunsongs have feathered webbed wings? Seems to have webbed at the tips but feathers at the "shoulders"
I prefer webbed on some and feathers on others. I think those are large scales, or else swirl patterns. I don't think they have half-feathered, half-webbed wings, but that's just me. Webbed 110%. To me feathered wing look weird on dragons of any sort. I'd rather no wings, like a traditional Chinese dragon the to have feathered wings. Location: Erm, I believe there is a stalker around here. Do help. 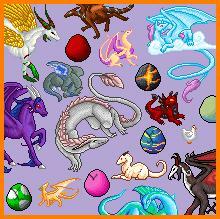 I think the feathered sprites are pretty, but in terms of looking more like a dragon I think webbed gets my pick. Although the feathered wings go well on the white dragon sprite, I think all dragons are kind of 'suited' to their own type of wings. Webbed go very well with the black dragons, feathered go well with the white. Welcome to the mad house XD Would you like a cookie? I like webbed wings, because they seem more 'reptilian' to me.. even though logically I know that birds are closely related to reptiles, and a feather is really just a big heavily modified scale, but still.. I like webbed wings more. Despite loving the white and Christmas '09 sprites. It really depends on the dragons... I guess? Feathers suit the whites very well because they represent peace somehow. And Snow Angels are snow angels. Whites have an angelic look as well. Most dragons that aren't a symbol of peace are best suited by webbed wings. Webbed wings are better for the dragons, I love the white dragon with its feather wings, but that should be an exception. I like them both. I have a slight preference for webbed wings overall, but one of my favorites dragons on DC is the white dragon, and they have feathers. So, eh. I think we need all types of wings here. I like webbed more, feathered reminds me of a bird too much. I like both types... but still, webbed looks more... dragonish to me . So I think that's my favourite! 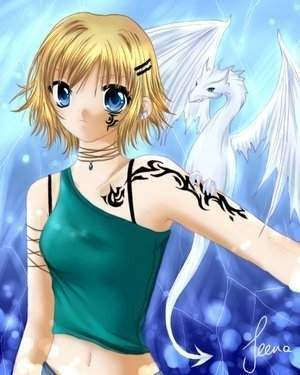 B-b-b-but I like wingless dragons *hugs her Vines and Waters*. I suppose I prefer feathers over webbed, feathers be pretty. Hrm...... could a Mod possibly change the poll for me? I would need to add two more answers. They would be (1) I prefer dragons without wings. and (2) I like both types of wings! If a Mod could do this for me, (because I can't figure out how to do it myself) it would be REALLY appreciated!!!!!!! I voted webbed. I think they make a dragon look more fierce. Also, webbed is the way I always think of dragons! But, I have to agree, could a Mod at least add a "both" option? I may of picked both instead of webbed if given the option. I also voted webbed. That's how you usually how dragons are depicted in the literature that I've read.